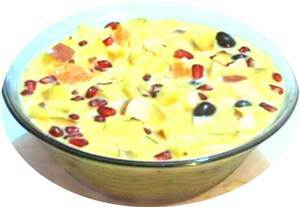 Fruit Custard is one of the sweet dish which can be prepared in very less time and very easy to make. Here you can get the detailed information about “How to make Fruit Custard“. Just follow the below instructions to know How to make Fruit Custard. It is also one of the easiest dessert and also very tasty and healthy. Kids will love this recipe and it is a nice way to include fruits in their diet. It will leave them asking for more. So just follow these below steps. (Banana,apple,pineapple, papaya, musk melon, chikoo/sapodilla, pomegranate, pear, Kiwi, grapes(seedless), strawberry etc). Do not add watermelon as it oozes water. After it comes to room temperature, refrigerate it. It will become more thick when cooled. Before serving, arrange the fruits in a bowl or cup and pour cold custard on top of it . Give Responses for "How to Make Fruit Custard"